Today we’ll start with the meats as that’s what the guide opens up with. Gareth picked out two types from Morrisons; a British Turkey Breast Joint with Smoked Pork Fillet and Crackling. This is cut to order at their butchery counter and costs £10 per kg with 1kg serving between 4-5 people. The other meat he chose was The Best Dry Cured Unsmoked Gammon Topside with Black Cherry and Ruby Port Glaze which is also £10 and serves 6-7 people, meaning you should have some leftover for your Boxing Day feast. Next is the vegetarian food. I have to be honest, I was really disappointed with what was on offer this year. We ordered the majority of our Christmas food from Morrisons last year but we’re using Tesco this year. You’ve got the choice of The Best Mushroom, Spinach and Maderia en Croutes which are £3.50 for 2, The Best Cranberry and Pistachio Nut Roast, £5 which serves 2 or The Best Jewelled Rice and Pearl Barley Bakes which again is £5. I can’t stand mushrooms, nut roasts are dry and I don’t fancy rice on my Christmas dinner. However, they do offer The Best Pumpkin and Sticky Fruit Festive Stuffing for £3 which sounds amazing. The next section in the Morrisons guide is the sides. You can have a full Vegetable Selection Pack which has everything you need for £9, including prepared parsnips, carrots, sprouts and ready to roast potatoes. Also on offer are individually prepared sides, costing £1.50 or you can pick up a pack of The Best Heritage Carrots with Cranberry and Orange butter and The Best Goose Fat Roast Potatoes, both for £3. In my opinion, Morrisons do the best party food in general. You can get a sandwich platter (classic or meat-free) for £6 each, both with 20 sandwiches on. This year, they’re offering a Vegan Platter for just £1.50 which has marinated cauliflower florets, dried tomato segments and corn fritas. And if you’ve ever fancied trying savoury churros, you can get a pack of The Best Churros for £3.50 where you’ll get 10 in a pack. Or maybe you want to try The Best Vegetable Tempura Nests, also £3.50 for 6. Cheese next and arguably the best part about Christmas. For just £6, you can have a Festive Cheeseboard which has five types of cheese, including a French Brie and a Bleu D’Auvergne. Alternatively, there’s The Best British Slate Cheeseboard for £10 where you’ll get six types of cheese as well as the slate board. You could go really over the top and order a British Cheese Cake for £55 which serves 40 people! And to round off today’s festive food, here come the desserts. The Best Passion Fruit Buche caught my eye because of the beautiful yellow exterior. You could finish off your meal with this at the cost of £8 and it’ll serve 8 people. There’s also The Best Raspberry and Prosecco Panna Cotta Wreath which is £7 and will again serve 8. And I can’t talk about Morrisons Christmas food without mentioning their Black Forest Christmas Tree Meringues. We get these every year and I can’t tell you how delicious they are. From the chilled section, you can get 2 for £2 and they go really well with a cup of tea. Complete the order form found within the book and take it into Customer Services along with a £20 deposit. If your order is less than £20, you’ll simply pay the total price of your order. If you’re wanting to pick your food up before Christmas, order by the 15th December but if you’re ordering for New Year’s Eve, place your food order by the 21st December. Go to the Food to Order website and browse the other items they have available. Choose the food you want to enjoy over the festive period and fill in the online form. Pay your £20 deposit as above and the same cut off date applies too. Christmas orders can be collected between the 14th – 24th December at a store of your choice in a time slot which is suitable for you. If your order was more than £20, the remaining balance has to be paid upon collection. 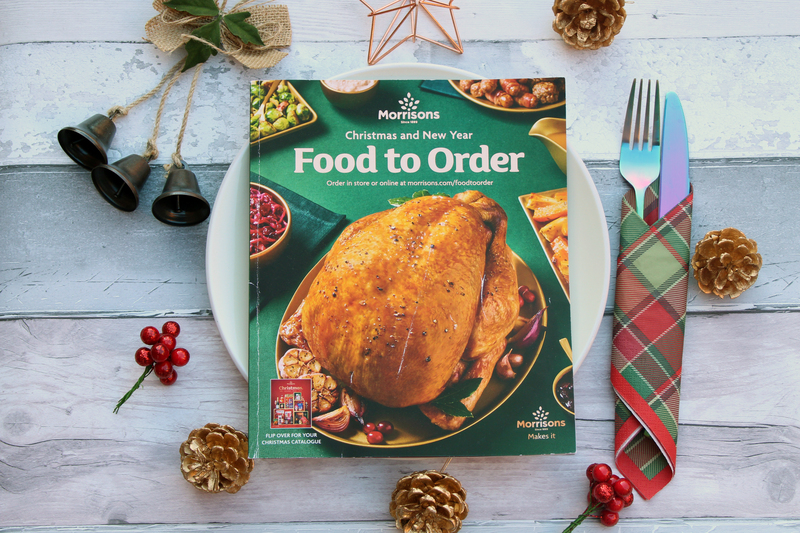 That’s my round up of the festive food available at Morrisons this year. Tomorrow, I’ll be covering Sainsbury’s offerings so make sure you check back for that!